Tan with tiny black, brown and white scales; round and small, up to 1/4″ in size. Before storing any woolen or natural fiber clothes, clean them according to directions. Zippered plastic bags or large plastic containers are ideal for storage. Do not store the boxes in your attic, garage or basement if possible. Mothballs leave a strong odor but will help deter fabric pests. Use caution when purchasing rugs or carpeting second-hand. 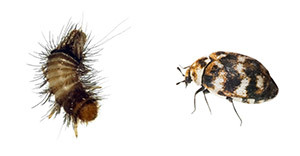 These items could bring unwanted pests like carpet beetles into your home. Inspect second hand items thoroughly.